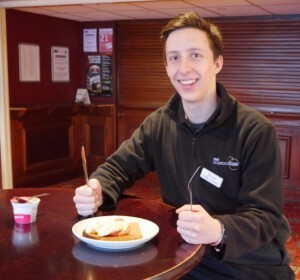 ‘The most important meal of the day’ – we’ve all heard that one, but when it comes to your training, it really is true – as Jonny our Fitness Instructor explains……. Having the right breakfast will provide you with many advantages compared to those breakfast-skippers! And, contrary to many opinions, breakfast can also lead to improved weight loss! This is because eating breakfast will leave you feeling less hungry than those who don’t eat breakfast, as they then tend to eat larger meals later in the day and snack a lot more. The energy provided by a healthy breakfast will mean that you can work harder and longer throughout the day, whether it is at work, the gym or general day-to-day activities. All of which result in more calories burned! So what should be eaten as part of a healthy breakfast? Carbohydrates are our fuel and energy so are definitely a must have. They come from cereals, oats and grain-based foods. Protein is used to both build and maintain muscle and will leave you feeling full up, which prevents snacking. Proteins can be found in the likes of eggs, meat, nuts and yoghurt. Breakfast is also a great time to get in some of your 5-a-day so try to include at least one portion of fruit too. Posted in All News, Fitness Tips.